The Russian Feast to the All-Merciful Savior and the Most Holy Mother of God was established on the occasion of portents from icons of the Savior, the Most Holy Mother of God and the Venerable Cross during the time of a battle of holy Prince Andrei Bogoliubsky (1157-1174) with the Volga Bulgars in 1164. The Cross is therefore venerated marking the victory of the armies of Russia over the Volga Bulgars. This is the first of three feast days of the All-Merciful Savior celebrated in August. 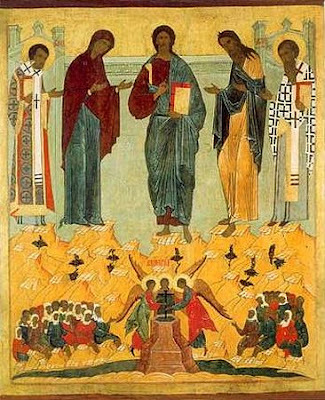 The second is the Transfiguration of our Lord, God and Savior Jesus Christ (commemorated August 6). The thirdis the Transfer from Edessa to Constantinople of the Icon Not Made With Hands of the Lord Jesus Christ (commemorated August 16, during the Afterfeast of the Dormition of the Most Holy Mother of God). These three feasts, as it were, connect together the Dormition Fast. This feast is popularly called the “Honey Savior/Spas” in Ukraine because during this time beekeepers harvest honey and hold honey markets – such as the famous one at the Kiev Caves Lavra to this day. It marks the exact day on which Saint Vladimir the Great officially baptized his people, receiving Orthodox Christianity in 988, even though today that event is commemorated by Ukraine on Saint Vladimir’s day. On this day water is therefore blessed.